Bagel, Bread And Bun Baskets Are Used For Displaying, Storing And Transporting Bulk Baked Goods And Other Foodservice Products. Bagel, Bread And Bun Baskets are made of ABS, polypropylene, polymer, and nickel chrome for long lasting durability. Cross stack lugs on dough and dough retarding boxes provide fast and secure stacking of boxes for storage. Box covers increase life of dough by keeping it enclosed to prevent crusting. 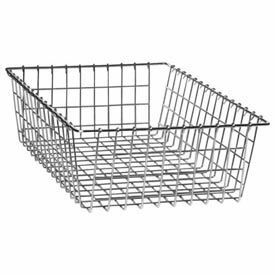 Wire baskets feature a level top to showcase full selection of goods. Dishwasher safe. Available styles include Doughnut Basket, Pizza Dough Box, Pizza Dough Box Cover, Dough Box, and Dough Retarding Box. Color finishes are Chrome and White. Dimensions and quantities vary per model.